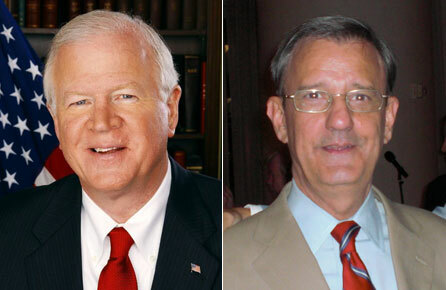 Republican Sen. Saxby Chambliss has apparently prevailed in a run-off against Democrat Jim Martin. Left, Saxby Chambliss, right, Jim Martin. At about 9 p.m. EST Tuesday night, two hours after polls closed, the Associated Press called the run-off election between incumbent Republican Sen. Saxby Chambliss and Democratic challenger Jim Martin. Chambliss, as expected, is the winner. Chambliss' win seems to put the Democrats' goal of achieving 60 votes in the Senate out of reach, at least for now. If Al Franken is able to prevail over Minnesota Republican Sen. Norm Coleman in the ongoing recount in their race, the Democratic caucus -- which includes independents Joe Lieberman and Bernie Sanders -- will have 59 members. Democrats can, of course, still try to persuade a Republican or two to cross the aisle.